Welcome to Detroit’s Cobo Center for Alibaba’s Gateway ’17 conference. Over the next two days, some 3,000 U.S. small businesses and entrepreneurs gather to hear and learn about business opportunities in China. Stay on top of what’s happening with our live updates below. More great video content tied to U.S. companies and brands that were at Gateway ’17. Chinese consumers have displayed an appetite for cherries grown in the U.S. Northwest. Keith Hu, director of the Northwest Cherry Growers association details how promotions and marketing have propelled the group’s Tmall store. And Ocean Spray was in the house at Gateway ’17. Can you spell (or even say) “proanthocyanidins?” They’re what make cranberries healthy. They’re also versatile and delicious. That combination, says Ocean Spray President Peter Wyman, is what underpins the success of the company’s products in China and its Tmall Global store. One U.S. brand that has found success in China via Tmall is OtterProducts, with its highly protective OtterBox smartphone cases. We visited the company in Colorado and spoke with its top executive to understand how it adapted its marketing strategy and positioning of its brands to make what would otherwise be a commodity into a premium product in a highly competitive market. You know that saying about an apple a day? Well, Washington State apple farmer send a lot more than an apple a day to China, and they’ve become quite the popular brand on Tmall. Watch the story of one apple farmer from Chelan, Washington, who successfully set his sights on China. The curtain has gone down on a successful Gateway ’17 conference. It’s almost time for us to wrap. But we’ll keep this blog alive for the next few days to keep sharing some of the interesting and abundant content and brand stories that emerged from this two-day gathering in Detroit. Before we sign off for the night, here’s a video with highlights of our two days in Detroit. Right next door to the wholesaling breakout session was the retailing to China one, chaired by Amee Chande, Alibaba Group managing director of global strategy and operations. 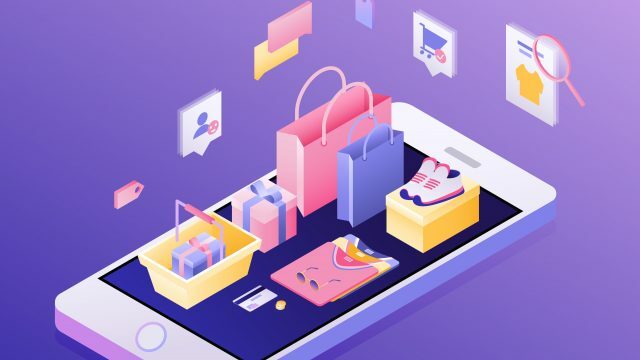 We ducked in to find out what kind of small businesses or brands should be eyeing a retail solution in China via Tmall Global. Chande said companies that already have a high brand awareness in China or those with “the desire to develop your brand” and/or a longterm interest in China are best-positioned to tap the market with Tmall Global. She described a relationship with Tmall Global as a longerm investment play, which requires investment into your brand and establishing a longterm presence in China. Tmall Global companies and brands also need agility and the ability to adapt to change. Patient is important, with small businesses having to truly understand the potential, not just look for immediate gain. And partnerships are the crux of making things work. They’re built on trust in all facets of the business, trusting distributors and wholesalers as they build their relationship with consumers. Partnerships matter, too, because good partners work with small and medium-sized enterprises to protect their intellectual property when they’re selling to China. Later in the same session, Sam Wolf, founder of LuckyVitamin and a popular brand on Tmall Global, shared some of his thoughts and information about how his family-run company has succeeded in China. He said small businesses need to know that selling on Tmall Global isn’t the same as selling on a branded website domestically or in other markets. Chinese consumers are also different fro Western consumers. To be successful, he said, you need to cater to their unique needs and shopping habits. Chinese consumers are always looking for a deal, want good value and have formulated their shopping habits around promotions for seasonal holidays. LuckyVitamin could have chosen several options to sell to China, but ultimately determined Tmall Global was the best way in for his business. Wolf cautioned that Tmall Global isn’t a get-rich-quick channel. To succeed there, a company needs investment, patience, testing of different products and strategies and to make a commitment to service. He said LuckyVitamin is still relatively new to Tmall Global, is still learning about China and Chinese consumers and is excited about the market’s longterm potential. Alibaba has announced a strategic partnership with fruit seller Driscoll’s and seafood company Chicken of the Sea to bring high-quality, imported foods to Chinese consumers. During a press conference at the Gateway ’17 conference, the companies signed a memorandum of understanding that would make products such as Driscoll’s strawberries and Chicken of the Sea’s tuna available for sale on Alibaba’s B2C shopping site, Tmall.com. Chinese consumers have increasingly sought out goods from overseas markets, often because they are perceived as higher quality and—when it comes to food—safer for consumption than domestic items. In a statement, Driscoll’s and Chicken of the Sea emphasized this point as one of the main reasons it was cooperating with Alibaba. “The Chinese market opportunity for fresh, American grown produce is tremendous and we believe Alibaba allows us to expand consumer access to our berries, and we’ll be able to take full advantage of that opportunity,” said Jae Chun, Driscoll’s vice president and China general manager. Fresh food has become an important sector in China. According to Produce Report, 36 million households in China bought fresh products online in 2016 and that number is expected to double by 2020. 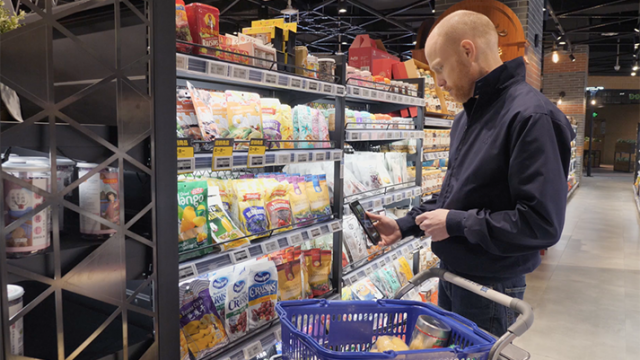 “The fresh shopper [in China] is a very, very sticky shopper,” said John O’Loghlen, director of business development for Alibaba in Australia and New Zealand. That means that when Chinese consumers find a brand they trust, they tend to be loyal to that brand. Some of the most popular American fresh food products among Chinese consumers are cherries, oranges, apples, grapes, pears, lemons, sea cucumber, king crab, cod, live lobster, shrimp, pork and chicken. Farmers and fisherman looking to position their products in China might want to consider the following growth areas: frozen and chilled foods as well as fresh; and ready to eat/cook..
A final important tip to know: Make sure you know the import and export rules and regulations for China. China takes this sector quite seriously, so there’s no room for error. There are a number of concurrent breakout sessions happening at Gateway ’17 on the afternoon of Day Two. All are aimed at providing education and advice for companies of different sizes and in different sectors who are looking to sell to or source from China. We ducked into a wholesaling session that covered Taobao Global, chaired and moderated by Alibaba’s Pier Smulders. In an opening presentation on “why wholesale,” the Australia and New Zealand-based Smulders offered some tips and key takeaways. If your product or brand is “new or newer in China,” if you don’t have a presence in the market yet, the wholesaling solution via Taobao Global may be right for your small business, Smulders said. Companies with just a few SKUs or looking to test the waters in the China market with a few SKUs from its product catalogue should look at this solution. Smulders advises small businesses and brands that are unknown in China to “tell your story, be authentic,” if you want to raise awareness and popularity of your brands. He told the story of a New Zealand company that had a “powerful video” about itself and its products. When they approached him about entering the China market, they mentioned they were going to get an agency to translate their video into Chinese and maybe tell the story over with Chinese actors in the video, he waved them off. And finally, he said companies that are new to China and looking to put products into the market there “need to make sure you’ve ticked off the basic intellectual property rules.” He described protecting IP as part of basic housekeeping and that resources are available to help businesses new to China understand what’s important. There’s so much going on in the Gateway ’17 Marketplace, it’s hard to tell what to cover first. We stumbled upon live-streaming and felt it really important to highlight why it matters if you want to do business in China. 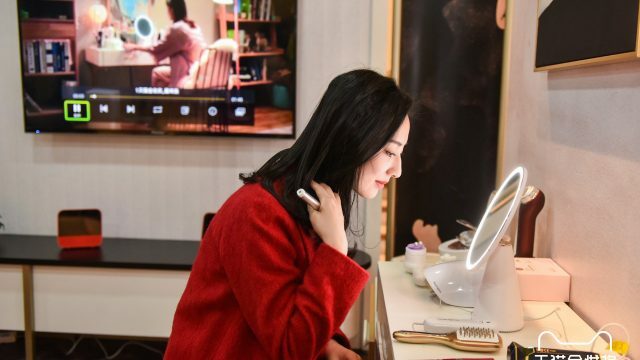 One of the best ways for brands to connect with Chinese consumers is through live-streaming of video. In the following video, Jeff Locker is live-streaming in Chinese from the floor of Alibaba’s Gateway ’17 Marketplace to literally hundreds of thousands of consumers, talking about the virtues of American agricultural products and offering coupons to interested buyers. Live-streaming is a key source of content, education and entertainment for Chinese shoppers online. It’s all built into the mobile shopping app. While the livecast was going on, viewers and would-be shoppers were also commenting on the fruit products on offer and the live-streaming commentators. Jeff got a thumbs-up for his Chinese from those viewers. 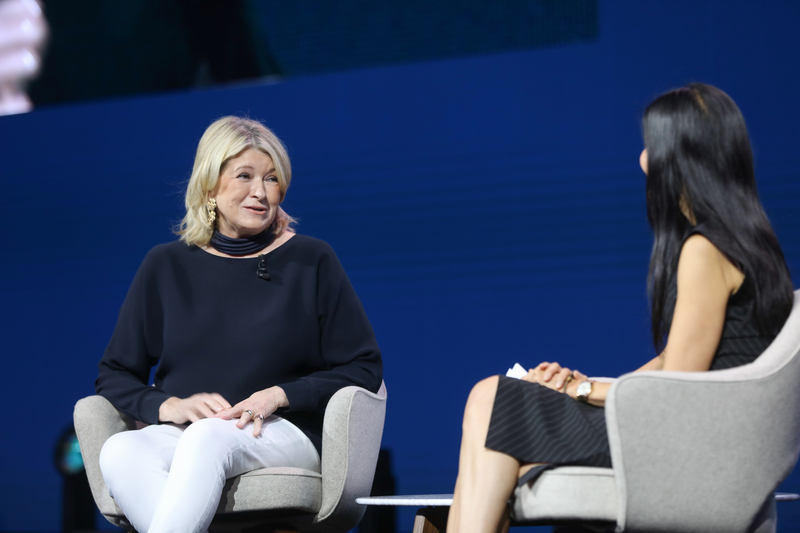 It’s a message we’re hearing a lot from presenters and customers at Gateway ’17, but the imperative of localizing a product or service to sell it in a new market outside your own was a key element of Martha Stewart’s presentation earlier this morning. Stewart also underscored the importance of using content — and delivering at least some of it via social media — as a key way to reach customers and build your brand in a cost-effective way. That’s a message that should resonate with brands that want to succeed in China, where shopping is viewed as an educational, entertaining and social experience. Alibaba Executive Chairman Jack Ma underscored that point, noting some 60 million customers log onto to Alibaba platforms each day without ever buying anything. Alibaba’s platforms are rich with content and opportunities to socialize. 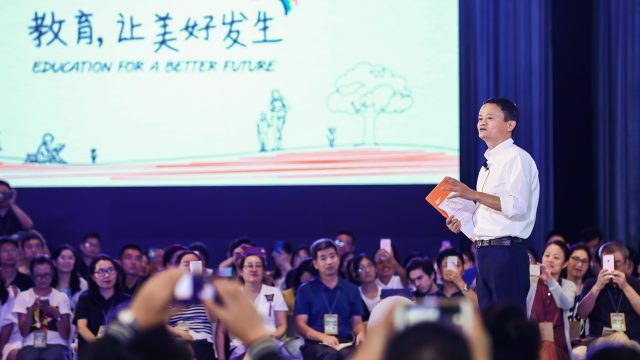 The next 30 years belong to small businesses, and those that don’t seize the opportunity to go global will likely disappear, said Jack Ma Wednesday. 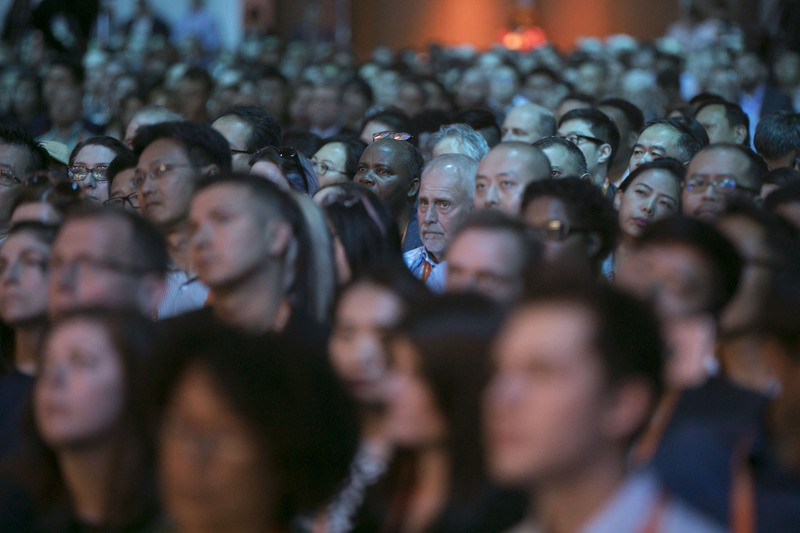 Addressing an audience of 3,000 small business owners and entrepreneurs in Detroit at Alibaba’s Gateway ’17 conference, the group’s Executive Chairman said that while large companies dominated the global economy over the past 30 years, the next 30 are going to be about flexibility and adaptability — traits those bigger entities have problems displaying. “In the next 30 years, the world is shifting from standardization to personalization. 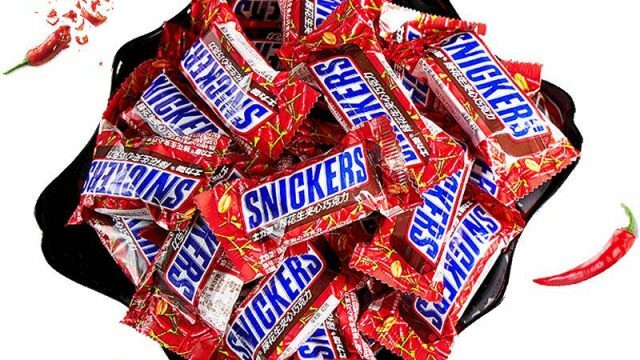 Big companies face huge challenges,” he said. That creates opportunities for small businesses, provided they can be agile in their operations. And while brute-force investment, boots on the ground and capital-intensive operations ruled in decades past, decades future will depend on being internet- and online-focused. “In the next 30 years, those companies who can use the internet well, those companies will win,” Ma said. 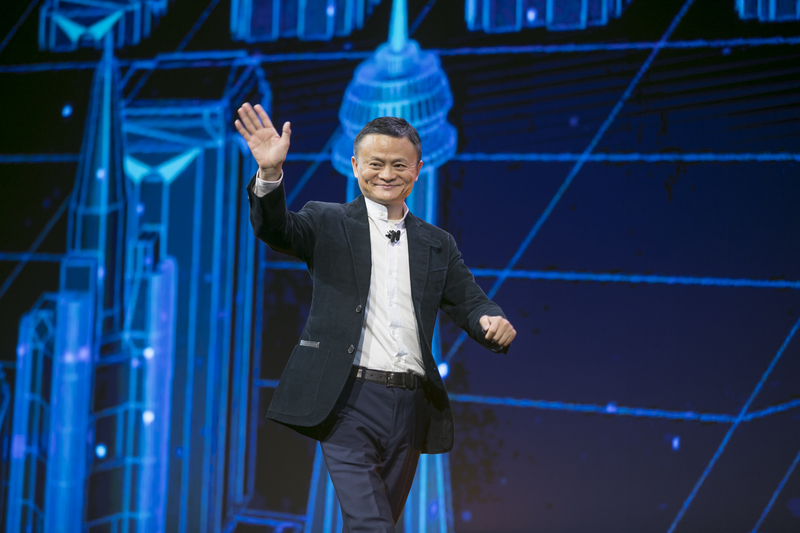 Ma’s hourlong talk offered glimpses into his views on Alibaba’s success amid tough competition over the past 18 years and tidbits of advice for small businesses looking to tap into China’s strong consumer and middle-class growth. In particular, his estimate that in the next five years, China’s imports of goods and services from other countries will hit $10 trillion is even more-optimistic than the government’s own $8 trillion forecast. Demand for food is already staggeringly high, with Chinese already consuming 600 million pigs and seven billion chickens a year and demand rising. And over the next 10 to 15 years, China’s middle class of 300 million — already around the size of the total U.S. population — is set to double. With the growing middle class, “the demand for high-quality products, high-quality services is rising,” he said. And that rise in quality consumption is a perfect opportunity for internet-savvy small businesses, he said. To succeed in selling to China, small companies need to be aware of how much business is conducted on mobile phones. Every day, some 200 million Chinese buy on Alibaba’s platforms using only their phones. “Doing business in a traditional way, I don’t think it will work. Use the internet, that’s a better way,” Ma said. He noted it took trader Marco Polo eight years to walk from Europe to China and another eight years to return. As Gerber’s baby foods found an audience in China, without the company yet focused on the market, it was forced to take notice. Looking to expand its presence in China, beyond the Chinese distributors that had been importing its products for resale in the country, Gerber looked to dedicated cross-border e-commerce platform Tmall Global. “When you enter a market, you really have to make choices about your partners,” Partyka said. “We really wanted to focus on a partner like Alibaba that had the reach,” he added. Moreover, the fast-changing landscape of online consumption in China is “where we think retail [as a whole] is going to go,” he said. And Alibaba’s shopping platforms are at the center of that “New Retail” trend. Gerber is currently celebrating its 90th birthday. Taking a page from Jack Ma’s focus on making sure Alibaba lasts 102 year, Partyka said he’s now looking toward the next 90 years rather than just short-term projections. 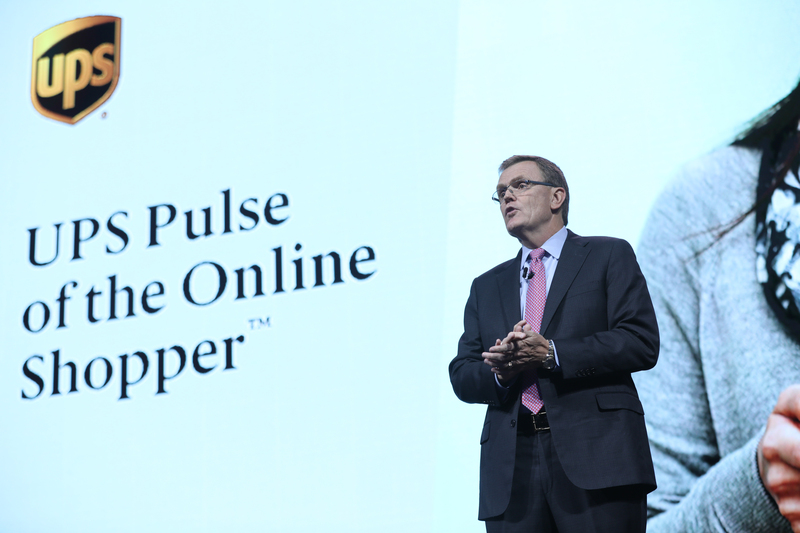 With U.S. exports to China surging for well over a decade, the opportunity for U.S. businesses to sell to that market has never been better, said UPS CEO David Abney Wednesday. “If you are serious about business today, you can’t ignore China,” told the gathered audience of 3,000 small businesspeople and entrepreneurs on Day Two of Alibaba’s Gateway ’17 conference. Abney said U.S. exports to China surged 115% between 2006 and 2015, and today, $4 trillion in goods and services are exported annually. China’s middle class of over 300 million – the size of the entire U.S. population – and forecast to grow has a “real desire for U.S. products and services,” he said. For small businesses looking to succeed in China, he said it’s important to understand local customs and “go native” and to customize products and services for the markets in which they wish to sell. He said UPS, which first launched service in China, had made its share of mistakes – including incorrectly and inauspiciously facing a painted dragon backwards on a UPS plane bound for China – has developed deep experience in China. That experience, and services that include 200 flights a week, two major processing hubs in Shanghai and Shenzhen, means small businesses “don’t have to start from scratch” in selling to China. He said a recent UPS report noted that 47% of U.S. customers surveyed had purchased something from an international retailer in 2017. That, he said, signals “a local shopping experience for these shoppers is critical.” Tips to give customers what they want include offering transparency about where their packages are and to offer a clear, all-inclusive price that reflects shipping and duty costs. Stadium Goods CEO John McPheters remembers well the exact moment when he knew he wanted to sell into China. A customer came into the collectible sneakers seller’s Manhattan store and bought $10,000 worth of Nike Air Jordans. His plan? To bring them back to China for resale. “So that opened our eyes to the opportunity,” McPheters told a sold-out crowd during day two of the Gateway ’17 conference in Detroit. Looking for the best way to take advantage of the burgeoning market for sneakers in China, McPheters discovered Tmall Global. He says the combination of Alibaba’s market-leading position in the world’s second-largest economy and it’s focus on nurturing small businesses sealed the deal for him. “Consumers had real faith in what they were doing, and the brands they were bringing onto the platform,” he said. McPheters also credits the round of venture-capital funding Stadium Goods landed in January in part to its presence on Tmall Global. Over the next six to 12 months, the company will focus on bringing lines of collectible kicks not yet available to “sneakerheads” in China in order to expand its footprint there. And, McPheters said, he will pubish much more content on Tmall Global, such as long- and short-form video, as a way of better engaging Chinese consumers. “We’re going to invest really heavily in that,” McPheters said. 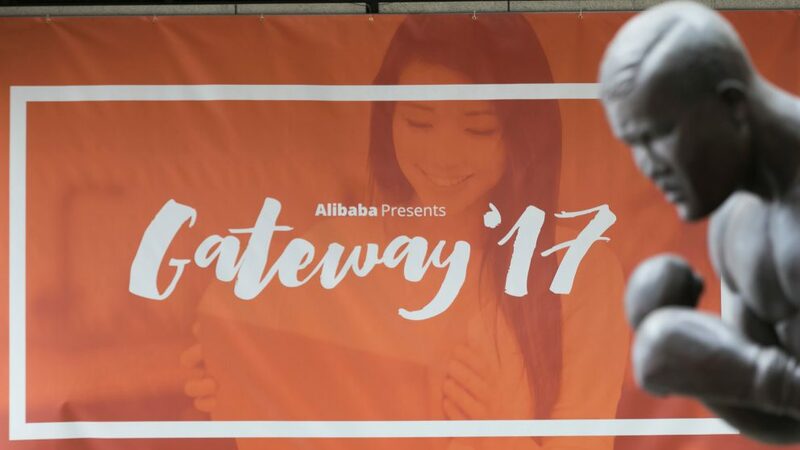 Day Two of Gateway ’17 opens with Alibaba’s U.S. customers and brands sharing their stories of making it in China — tales of careful planning, initial trepidation, a building up of trust and expertise, and ultimate success in building up awareness in and selling to the world’s largest consumer market. The Cobo Center Ballroom is filling up for Day Two keynotes. We’ll be live-streaming Jack Ma’s talk on the China opportunity only on our Facebook page at 9:30 a.m. EST. Tune in. Alizila’s Tom Brennan always goes where the news is. This week, no surprise, he’s with us at Gateway ’17 in Detroit. And in this video, he shows us what’s really happening on the floor of the Gateway ’17 Marketplace. One of the brands on the Marketplace floor of Gateway ’17 is the iconic Gerber. We’ll hear from its President and CEO, Bill Partyka, later this morning about how his company gained the trust of parents worldwide. Until then, we give you this story, which looks at the Gerber phenomenon in China. Well before there was an official brand channel to sell into China, Gerber products were on the market there via Alibaba’s Taobao marketplace. China’s an attractive market, with 20 million babies born annually and a desire from parents for wholesome and healthy food. And behind the brand and its rigor for quality, are multi-generation farmer/suppliers like the in the video below. After a good night’s sleep and a hearty breakfast, we’re back for Day Two of Gateway ’17 at Detroit’s Cobo Center. There’s a full agenda ahead this morning, and rest assured, we’re going to cover it for you. A quick preview of what’s to come includes customer spotlights by Stadium Goods and 100% Pure, a keynote from UPS CEO David Abney, a fireside chat with Martha Stewart, and Jack Ma is back onstage to talk about the China opportunity. The afternoon agenda is all about breakout sessions about selling to and sourcing from China for the 3,000 attendees, with focuses on their specific verticals and business segments. There will be sessions on fashion & apparel, everyday goods, fresh food, finding suppliers, brand awareness and others. 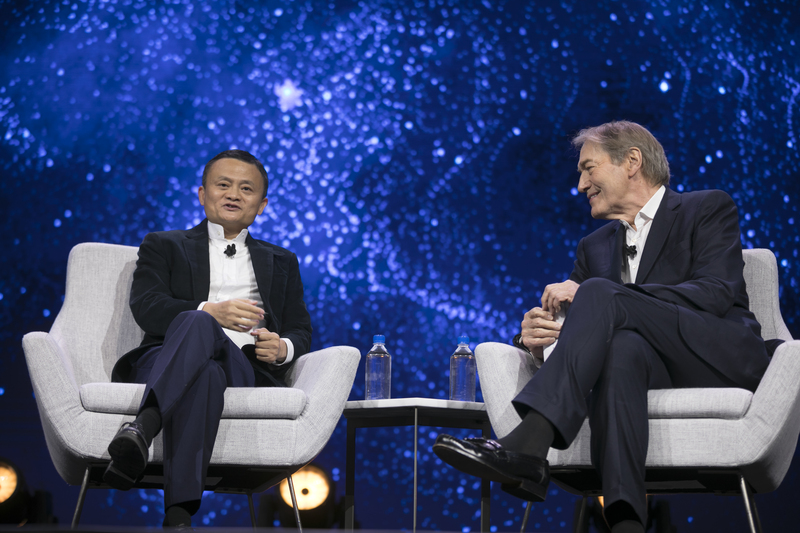 OK, we’re still here, but only to REALLY wrap up an action-packed first day by leaving you with the full video of Jack Ma’s fireside chat with Charlie Rose. In it (spoiler alert!) the Executive Chairman and Alibaba founder speaks candidly about the group’s past, present and future and offering business lessons learned in building up the group’s annual gross merchandise value to nearly $550 billion. Good night. We’re signing off and will be back with live updates bright and early Wednesday from Detroit’s Cobo Center and Alibaba’s Gateway ’17 conference. As we wrap up Day One of Gateway ’17, a shout-out to Jewelry.com, on the Marketplace floor of Gateway ’17 to share its experiences of selling premium and branded jewelry to Chinese consumers. As Director of Marketing Jon Azrielant put it, Jewelry.com didn’t choose China. China chose Jewelry.com. Even before the brand started shipping to China — or even aiming its products at Chinese consumers — enterprising buyers from the Mainland were buying in the U.S. and sending products back to friends and family in China. That was before Jewelry.com opened a Tmall storefront, where it’s now going strong. Below is a video highlighting what Jewelry.com is up to in China. That was Alibaba Executive Chairman Jack Ma’s loud-and-clear message to 3,000 businesspeople and entrepreneurs on the opening evening of the group’s Gateway ’17. The two-day event in Detroit is aimed at educating U.S. small and medium-sized enterprises and brands on how to sell to or source from China. In a candid and open exchange with journalist Charlie Rose, Ma walked the audience back to 1995, when he first encountered the internet, struggled to convince friends and investors to believe it was the future the way he knew it would be and his first internet company, called China Pages. He recalled how he had a friend with a TV camera tried to memorialize that first internet connection he made as a very early subscriber. “I dialed from Hangzhou to Shanghai, then Shanghai to America to connect from the Internet. It took three hours-and-a-half to download that first front page,” Ma said. China Pages ultimately flopped, but it gave Ma — a teacher by training — a number of lessons learned and a taste of entrepreneurship he retains to this day. And four years later, in 1999, he and 18 friends founded Alibaba, whose starting capital was everything those founders could put on the table and now has a valuation in excess of $300 billion and nearly 60,000 employees. Ma told the audience that he believes a successful company must be mission- and vision-driven and always thinking and planning ahead. Few ever see disruption coming. “The internet is a 10,000 meters running race. We just finished the first 100 meters. Do not think the people next to you are competitors,” that early in the race Ma said, noting few could have predicted the demise of Netscape or Yahoo. “Don’t believe you’re good all the time. Be paranoid,” he counseled. Ma said the key to corporate success is to put the customer first. “Making your customers happy is important,” Ma said. He told the U.S. businesses that he has witnessed foreign enterprises fail in China because they got their priorities wrong. Good companies are also built on trust and culture, Ma said. He said Alibaba has spent a lot of time and resources to build up that trust. And inside the walls of Alibaba offices, the company retains the culture of trust that prevailed among the original founders, he said. That’s the best way to ensure employees are satisfied and remain innovative. “If you want to have smart people working for you, people need to be ruled by culture,” Ma said, not strictly by rules and regulations. Alibaba has fashioned itself as an “asset-light” company focused on building infrastructure for commerce and an ecosystem for the benefit of customers and users, rather than focusing on being a transactional one. Ma said Alibaba is highly receptive, though, to the needs of its customers and merchants and not dogmatic about its strategy. 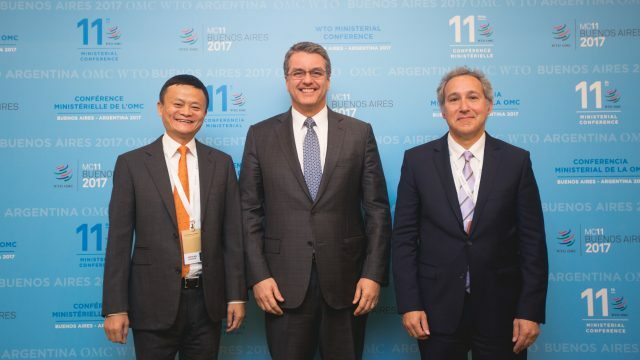 Alibaba, whose revenue brings it close to the size of the gross domestic product of Argentina — currently 21st in the world — has bigger ambitions. Ma said the hope is that Alibaba’s size in 2036 will make it comparably sized to the world’s fifth-largest economy. We are live now. Fireside chat with Jack Ma and Charlie Rose, live-streamed only on our Facebook page. Tune in. His Cleveland Cavaliers may have gone home empty after losing the NBA Finals to the Golden State Warriors earlier this month, but businessman Dan Gilbert was talking success on the opening night of Alibaba’s Gateway ’17 conference in Detroit. Gilbert, who besides his interest in the NBA franchise is the founder and Chairman of Quicken Loans and Rock Ventures, told the assembled 3,000 small businesspeople that small businesses are vital to the future. “Most innovation comes from small businesses…it’s a great time to be an entrepreneur,” Gilbert said to the Cobo Center crowd. His message to small businesses? “Don’t be afraid to take on big guys because you’re small,” he said. Alibaba’s Gateway ’17 conference in Detroit is an opportunity for small businesses “to think bigger, to think global, to take the things you do in the United States of America, in Michigan, in Detroit, and bring it to the other side of the world,” said State of Michigan Lieutenant Governor Brian Calley. Speaking to a crowd of around 3,000 to open the two-day event at Cobo Center, the political leader said he’s supportive of efforts to propel and grow small businesses. “The one thing that we’ve learned over the course of the last decade is that to make an economy work, there has to be an ecosystem from large to small,” he said. About 100 Detroit small businesses and 600 from across Michigan are attending Gateway ’17. Participants come from nearly every U.S. state. Nobody can say Gateway ’17 didn’t start off with a bang. Drummers take to the stage — and the ceiling, and everywhere in-between — to drum in the keynote presentations. Ready for Gateway ’17 keynotes and Jack Ma fireside chat. The Grand Ballroom at Detroit’s Cobo Center is filling up in anticipation of keynote presentations and a fireside chat between Jack Ma and Charlie Rose at 6 p.m. EST. The talk will be broadcast live on our Facebook page. Tune in. On the floor of Alibaba’s Gateway ’17 Marketplace, Alizila ran into Mondavi’s Berny Yang, who showed us a special Gateway ’17 wine gift box the California winery did up special for the event in Detroit. Inside the box is a Mondavi Napa Cabernet Sauvignon and a Fumé Blanc that will be served at a Gateway ’17 event Tuesday evening and will go on sale on Tmall on Wednesday. Mondavi is on the Marketplace floor Tuesday and Wednesday, sharing its experiences of selling wine to China. Yang recently did a podcast with Alizila, detailing the vintner’s success at selling its premium wines on Tmall to upwardly mobile Chinese consumers. Talks with Yang are always informative, with his years in the spirits business and knowledge of the Mondavi brand. Tuesday’s was no exception. Wine is a popular category for Chinese consumers, and Mondavi has been strong both in segmenting its wines into the different categories sought by different age groups and demographics. Yang told Alizila that the data provided by Tmall enabled Mondavi to make smarter decisions about how to segment and price. 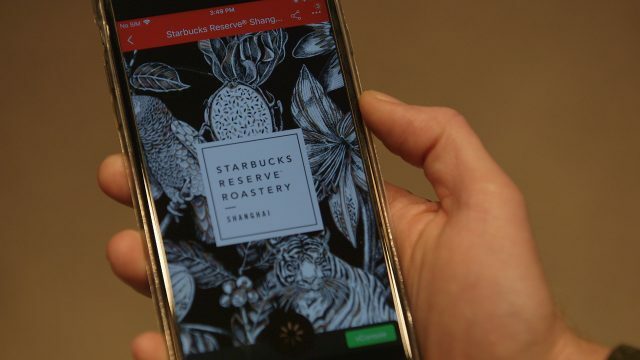 As well, the platform’s concierge services that help customers with things like wine-pairing questions, was educational and provided a strong user experience in line with the brand. Below is a video we did recently about Mondavi in China. Watch and enjoy. Alibaba Executive Chairman Jack Ma toured the Gateway ’17 Marketplace floors with Executive Vice Chairman Joe Tsai and President Michael Evans. Ma spoke to Alibaba’s customers — small businesses who sell everything from ginseng to sneakers to China, or who source materials from China via Alibaba’s e-commerce platforms. Ma later addressed a group of those small businesses, saying the future looks bright for U.S. small enterprises who focus on China, because for “the next 30 years, China domestic consumption will drive the global economy.” China’s demographics — the country has a middle class of about 300 million, which is set to rise to over 500 million in just a few short years — create tremendous opportunities for companies offering high-quality and a good variety of products. He said he hoped the Gateway ’17 conference will be just the first of many to come. Ma said Alibaba is looking to build up training centers in the U.S. to help the education process of how to effectively sell to Chinese consumers and said the group is working with authorities and partners to help U.S. SMEs. He said Alibaba will also have a bigger presence on the ground in the U.S. to aid those efforts. He said he’d like to see policies that lower or eliminate tariffs and enable clearance of goods in 24 hours and that he continues to champion the Electronic World Trade Platform — the creation of zones where that kind of frictionless, cross-border electronic trade can take place, enabling small businesses to climb on and reach consumers in other parts of the world. Ma is due to speak with Charlie Rose at 6 p.m. EST Tuesday, a talk that will be live-streamed on our Facebook page. We’re counting down to the kickoff of Gateway ’17 and strolled the Marketplace hall, running into two rolling cyborgs, among other “people.” Keynotes begin at 5 p.m. EST. Executive Chairman Jack Ma will speak with Charlie Rose at 6 p.m. EST, live-streamed on our Facebook page. Don’t forget to tune in. In the meantime, here’s a sneak peek of what’s in store.